This easy-to-use multipurpose drum tool can be used to lift closed-head 30 and 55-gallon plastic, steel and fiber drums with top lip. The drum lifter manually attaches to the drum top lip. The drum can be transported with use of an overhead-lifting device (not-included). 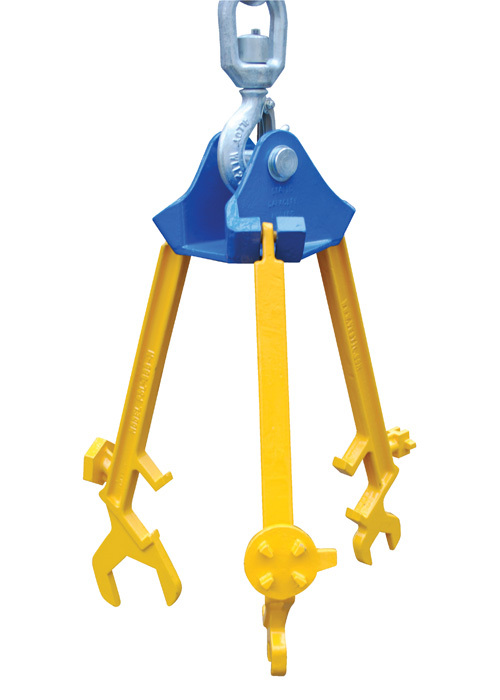 The patent pending design includes built-in bung wrenches for opening most types of bungs. At the ends of each arm, there is a wrench. The large and middle sized wrench fit drum faucets. The small wrench fits the top ring bolt on open-end type drums. Also includes built-in plug wrenches for use with steel drum ring and most types of drum faucets and valves. 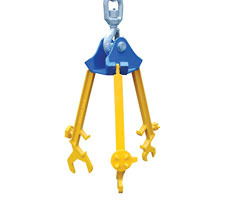 Constructed of steel with a yellow powder coat paint finish, this unit will hold up to 800 pounds. Surpassingly well made. Really liked the price. THIS IS A GREAT PRODUCT IF YOU HAVE ALOT OF DIFFERENT SIZE DRUMS TO MOVE AROUND A BIT. THEY SEEM EASY TO USE, AND GRIP GREAT. NOT FOR LONG MOVES, BUT GREAT IF MOVING FROM ONE AREA TO THE NEXT. I USE MINE ON A OVERHEAD LIFT, SO I KNOW THAT IS CAN TAKE THE MAX WEIGHT. I LIKE THAT IT FITS SO MANY SIZES OF DRUMS AND PLUGS.